It is all well and good railways (especially urban railways) being high capacity frequent transports but it is equally important that the stations can cope with the numbers of passengers travelling through them. Otherwise a dangerous situation can arise due to severe over-crowding. 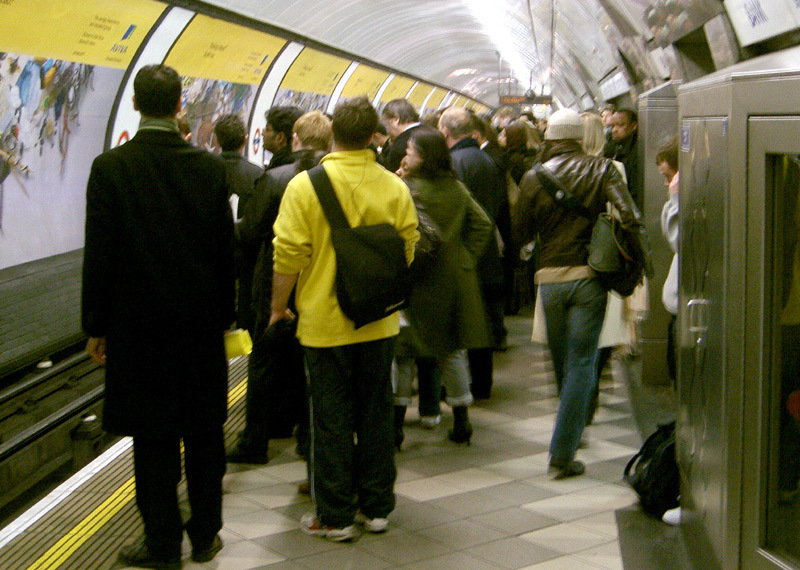 In cities such as London with its older underground railway system it often happens that at busy stations served by narrow passageways (some of which include stairways too) and just a couple of lifts / escalators the arriving passengers are often only just about clearing the platform when the next train is already entering with yet another load of passengers. This especially occurs during the rush hours and when there is a large event which attracts a lot of people to a specific area. Especially where a platform has only the one exit point it can take several minutes for the arriving passengers to clear it - at the busiest of times it is not unknown for the next train to be arriving with yet more passengers whilst the passengers from the previous train(s) are still trying to exit from the platform! 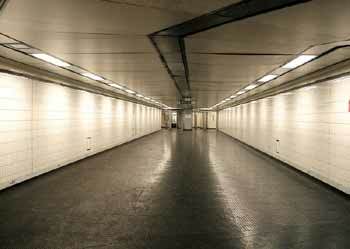 Holborn (Piccadilly line) left and South Kensington (District & Circle Lines) right. 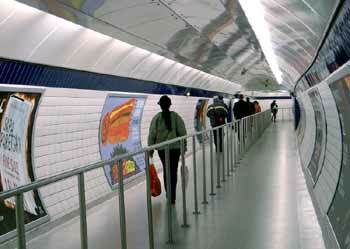 Covent Garden Station is one of several in central London which is served by lifts and not escalators. Being at the heart of an area which is very popular with both locals and tourists this station is so busy that even with four lifts crowding is commonplace and although discouraged (because the distance between the upper and lower levels is equivalent to that of a 15 floor building) some people use the emergency spiral stairway instead. Of course the optimum solution would be to replace the lifts with escalators - but apart from the physical logistics of finding work sites and a new location for the station building, etc, there is a question of money ie: who pays? Maybe this would be another way we could spend our oil wealth, instead of it all seeping (leaking) away to where-ever and who-ever as at present. 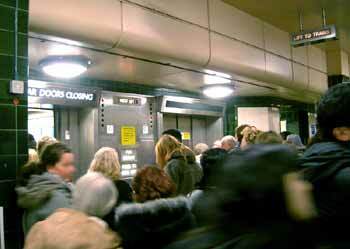 Sometimes both lifts and escalators can become out of service (either through breakdown or planned maintenance) and every five decades (or so) they require complete replacement - a process which can take many months, during which time passengers can unfortunately be seriously inconvenienced - especially at stations where there are no alternative routes so they have to be closed completely whilst the works progress. To compound matters it has been known for delays obtaining spare parts to result in their being out of use for extended periods of time, although often passengers are able to use escalators as fixed stairs and walk. 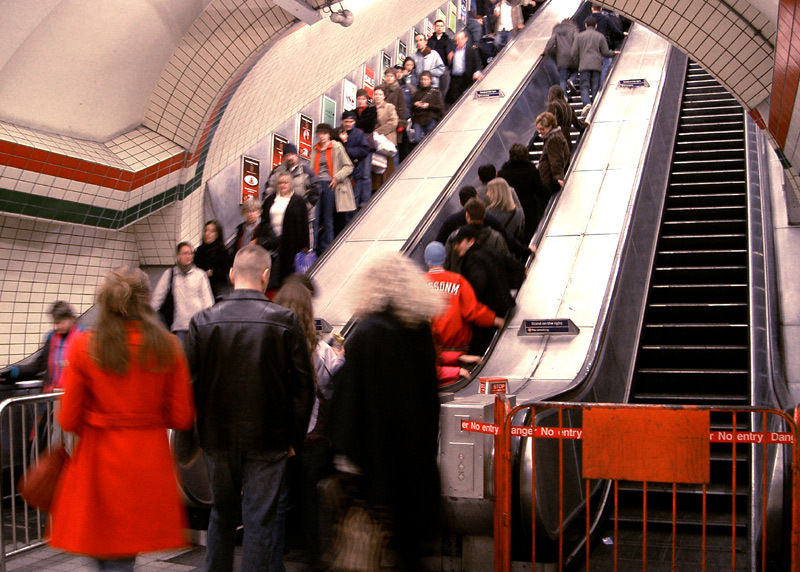 Because they are in continuous motion and immediately available moving stairways (ie: escalators) are generally better at shifting large crowds than lifts - for which passengers often have to wait. Note the closed (failed) escalator - fortunately there are enough escalators here and elsewhere in the station for the station to remain fully open...(Piccadilly Circus) Because of escalator maintenance and to avoid overcrowding by arriving passengers unable to exit from the platform area the only "down" escalator was reversed to travel upwards resulting in the banning of all access to the Northern line platforms at Tottenham Court Road station (instead departing passengers had to use nearby stations). 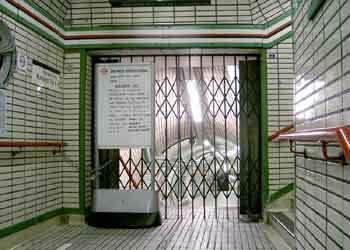 This image shows the also closed interchange passageway from the Central to the Northern Lines, and with interchanging passengers also being forced to divert via other routes and change trains twice the inconvenience was "very considerable". 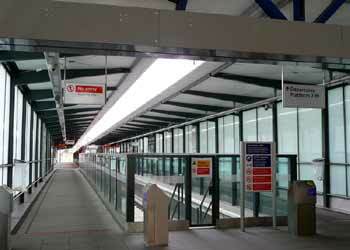 Creating more exit points from the platforms to the circulating area before the passageways to the lifts / escalators. At some locations it might even be better to provide new completely independent ticket halls and accesses to street level, as well as extra platform entry points - this solution is most effective when the existing entrances / exits are towards one end of the platforms because with the new facilities being installed towards the 'other' end of the platforms they will empty more quickly between trains - and passenger loadings on the trains will be more balanced. The significance of this last point is that too often when passengers arrive on a station platform they remain in that area - and then try to board the train near that location too. If the passenger entrances at every station were at approximately the same location along a train's length then that part of the train would quickly become over-crowded whilst other sections of the train would remain empty. Since it usually takes longer for passengers to board / alight crowded trains the longer "dwell" time delays the overall services and reduced the effective track capacity. 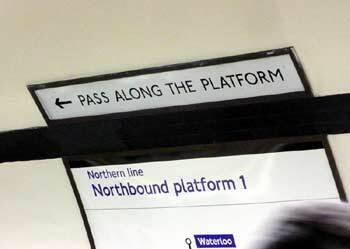 Encouraging passengers to pass along the platform can help reduce this and reduce delays - many regular passengers who are "in the know" already do this. Sourcing locations for new station facilities (either surface or subsurface) can represent logistical challenges, especially in heavily built up areas. New surface buildings may require the demolition of existing buildings, or the abstraction of land from an existing open space, parkland, etc. A much favoured location for ticket halls is below a road junction with entrances on several sides of the junction. This also makes crossing the road safer - although many pedestrians will still prefer to cross the junction at surface level. 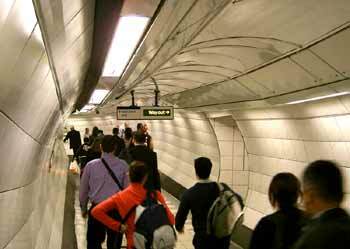 Digging new ticket halls, passageways, creating new street access, installing escalators, etc., below ground can be a very expensive process - and disruptive whilst the works are in progress. Sometimes though, the price of not making such investments can be even more expensive. 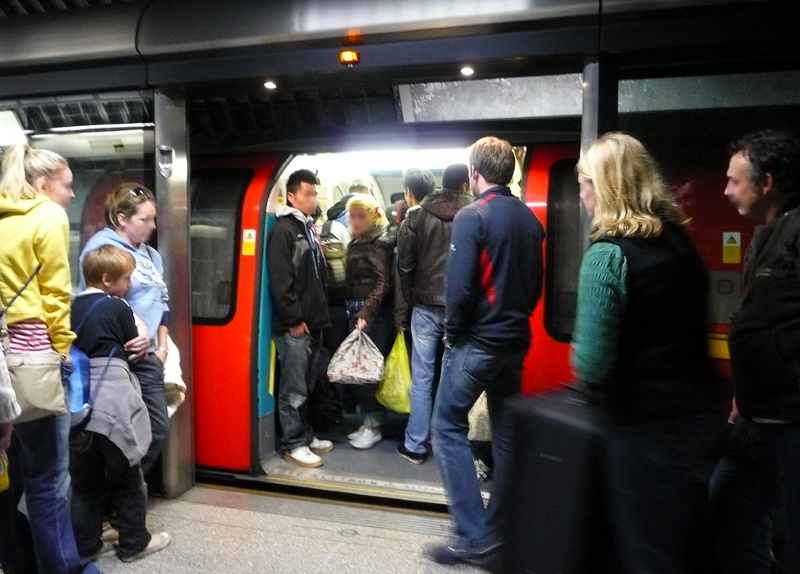 The cheapest solution for when platforms become very crowded is to restrict access to the platforms, perhaps by a member of the station staff temporarily blocking access to the escalators - although this can lead to passageways and / or the ticket hall becoming very crowded instead. To avoid the people at the back pushing and shoving it is important that everyone is kept well informed as to exactly what is going on - and why. Yes it is a nuisance - especially for people with time schedules to follow (important meetings, time-specific trains & aircraft to catch, etc.,) and homeward-bound passengers who are often *very* fed up and *very* intolerant of any delays which make them victims of "time theft" - but at least its better than being in a situation where the platforms are so overcrowded that the incessant flow of yet more passengers sees the situation arise whereby passengers already on the platform are being forced so dangerously close to the edge that there is a risk of them falling on to the tracks. Indeed, as anyone who has stood on a very crowded platform will attest, it is an absolute miracle that so rarely are people killed or injured from falling off severely overcrowded platforms!!! One station where platform crowding is a special concern is Lo Wu, which is within the Closed Area on Hong Kong's northern frontier with the rest of China. This very busy station serves as a primary checkpoint for rail passengers between Hong Kong and the rest of China, rather than serving a specific residential/commercial area like most other stations. 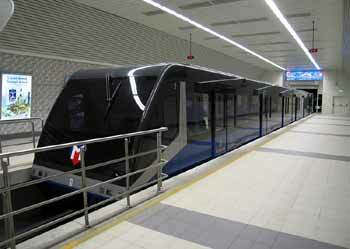 To split passenger flows the station features separate arrival and departure platforms. Arriving passengers use a shared island platform which is located centrally between both tracks whilst departing passengers use side platforms, one each per track (ie: this station uses what is known as the Spanish Solution - as described further down this page). To further reduce overcrowding on the departure platforms extra sliding doors have been installed between them and the ticket barriers, these control passenger flows by closing a couple of minutes after a train arrives. Even with these measures at busy times passengers may have to miss a train (or two) before being able to board the next available train - which because of the two departure platforms and that the trains alternate between tracks may actually be the third train to leave the station. Installing platform edge doors would also improve safety, but again, who pays? - maybe this would be another positive life-enhancing way to invest our windfall oil revenues? 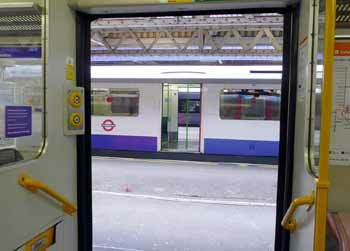 Platform edge doors are looked at on the main Halts, Stops & Stations page this link goes straight there. For safety it is important that platforms do not become overcrowded and that passageways can cope with passenger numbers. 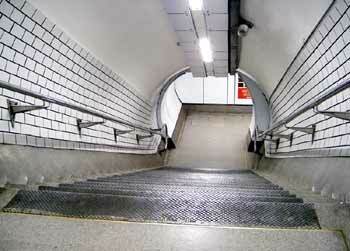 These views come from London's Bank station, and show the northbound Northern Line platform. 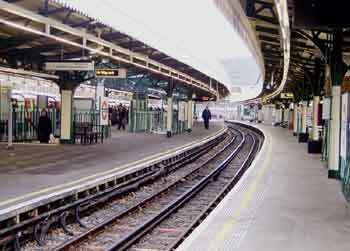 Left: This shows a fairly empty platform shortly after a train passed through. Wall and floor signage encouraging passengers who have just entered a station platform to spread out along its length - rather than just congregate near the entrance, where (at busy times) they cause congestion and prevent other passengers from also accessing the platform. 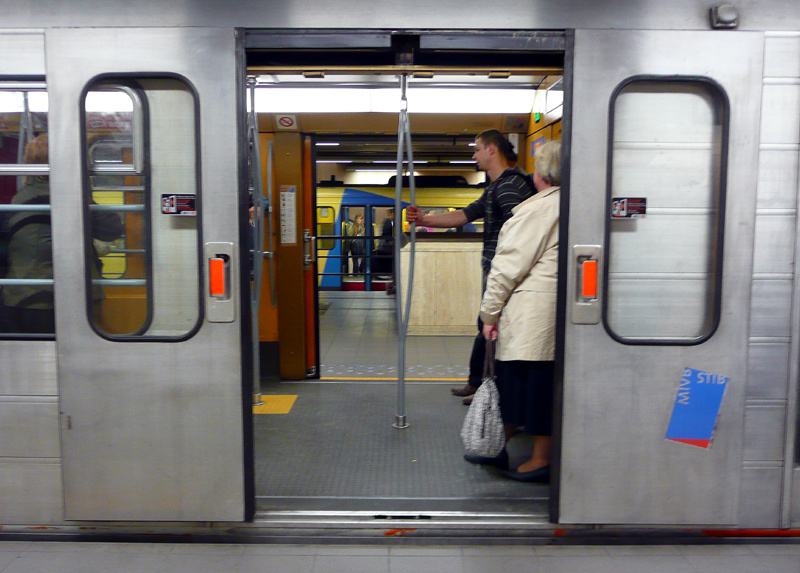 Platform doors increase both safety and the perception of safety on very crowded station platforms - although crushing can still remain an issue. Note how in the image on the right the people who wish to board the train are first waiting for alighting passengers to squeeze past other passengers and leave the train - this helps reduce station dwell times as well as make space for them when they are finally able to board. In London only the 1999 Jubilee line Extension includes stations which feature platform doors. 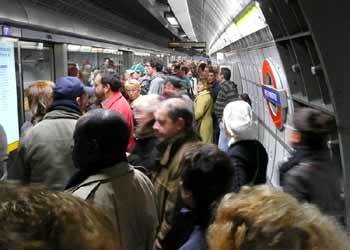 These images were taken at a very crowded Waterloo. 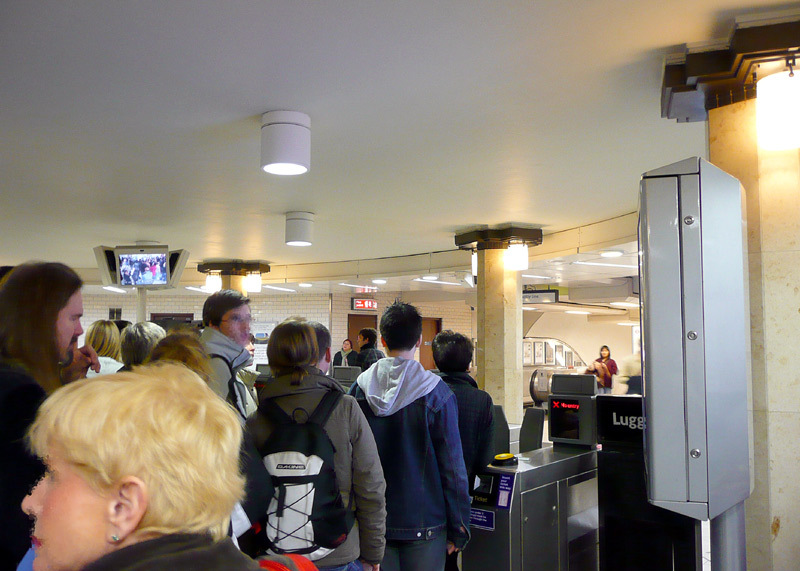 Passengers being held back at the ticket barriers in order to prevent severe overcrowding on the platforms and passageways. 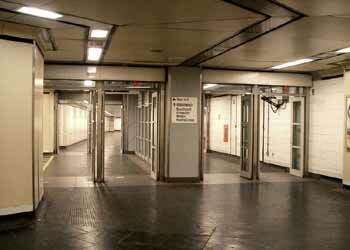 A bi-directional interchange passageway with a small crowd stridently surging forward. Sometimes passageways can be fitted with physical barriers which will help keep the passenger flows apart. But this is only feasible if the passageway is wide enough - otherwise there is a risk of so severely constricting flows that they are significantly slowed. 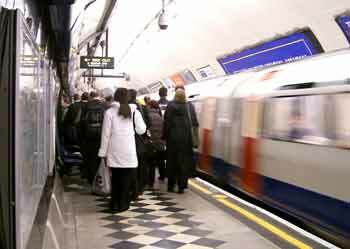 Even then, as the image on the right shows, barriers are not always effective in separating the passenger flows, especially when one direction is busier than the other or some people are dawdling (ie: walking very slowly) whilst others wish to walk at a speed which implies that they would like to arrive 'today' (ie: more quickly). Newer systems are usually designed with more escalators and wider passageways so as to improve handling of passenger flows at even the busiest of times. 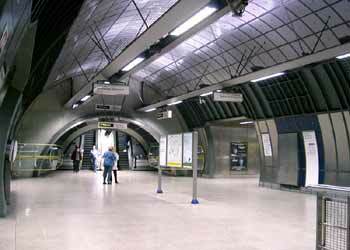 This wide circulating area between the platforms was built for the London Underground Jubilee Line extension which opened in late 1999. 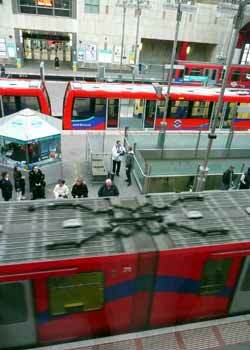 It is at London Bridge station, which in addition to being an important traffic destination in itself is a very busy interchange station with the mainline railway and the City branch of the London Underground Northern Line. 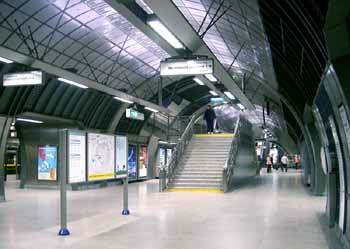 To adequately cope with large passenger volumes it features multiple accesses to / from the station platforms, a set of escalators at each end (leading to two different ticket halls, one of which also serves the mainline railway station) plus in the centre a dedicated interchange passageway (for passengers interchanging with the Northern Line) that is reached by a double sided stairway. 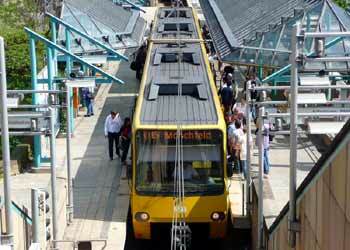 Click either of the above images or hereto see larger versions plus an extra view of the station in a new window. . These passageways were built in the 1970's and are at Moorfields station on the Liverpool (Merseyrail) Loop & Link city-centre underground system. In the view on the right there are two pairs of doorways - either side can be used by passengers continuing along the passageway to interchange between the Northern and Wirral Lines however the left pair (only) also leads to some escalators and a ticket hall. 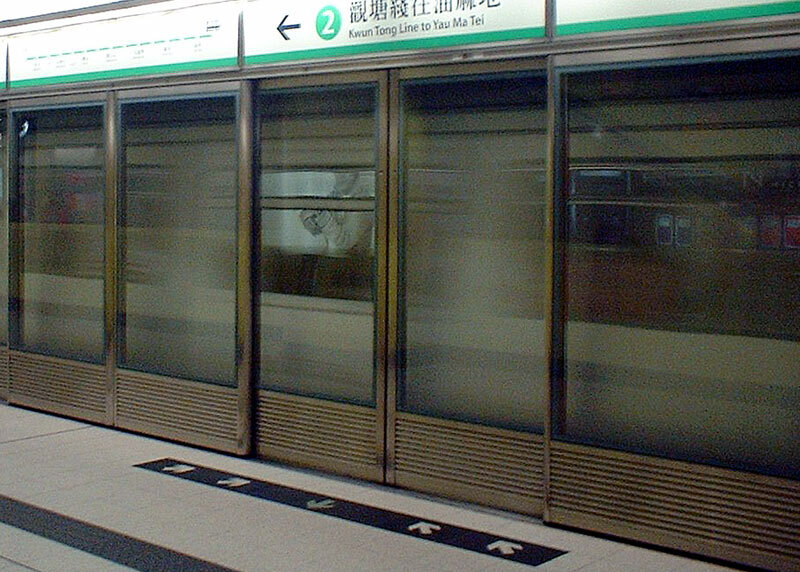 To separate the different passenger flows there is a glass screen (wall) which prevents any access to the escalators from the doorways to the right. Regular passengers will soon become accustomed to this arrangement and they should find that because it can reduce conflicting movements it will prove to be beneficial. 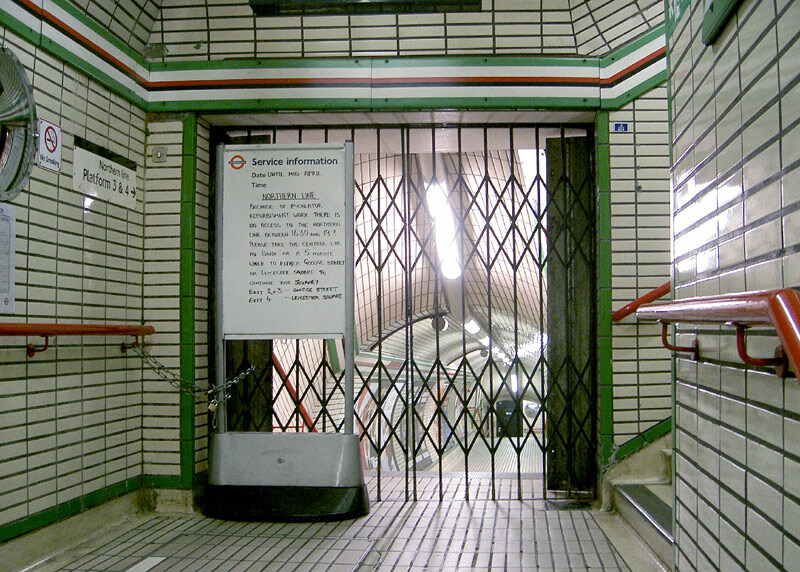 In the immediate period before the construction of London's Victoria (underground) Line research was conducted into passenger flows in station passageways. 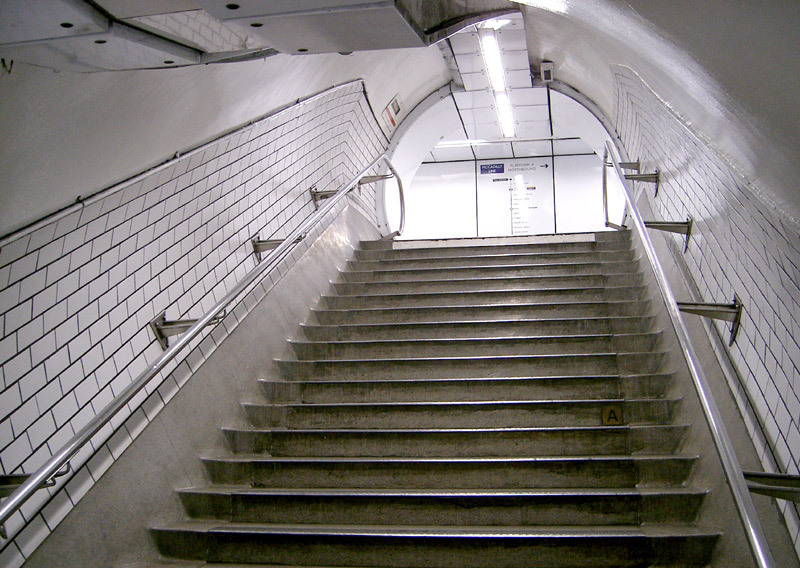 This found that stairways posed the main obstacle to the passengers maintaining a steady walking speed and that they needed to be half as wide again as the passageway if this loss of speed was to be avoided. 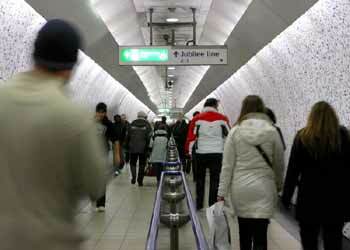 For level footways passengers were found to walk at 3.6mph (approx 5.8km/h). Climbing up a flight of stairs brought the speed down to 1.8mph (approx 2.9km/h), whilst descending down a flight of stairs was only slightly faster at 2.2mph (approx 3.5km/h). ["The Story Of The Victoria Line" by John R Day, 1971 reprint. published by London Transport]. Passenger flow experiments before the construction of London's Victoria Line found that stairways significantly reduce the speed at which passengers progress through the station passageways. Staircases which are used by passengers walking in both directions can also act as bottlenecks - and result in conflict between people going in opposite directions. Short of installing a second stairway so that each flight of stairs is dedicated to people walking in each direction, the easiest way to resolve this is to split the stairway into two sections along its entire length with each section dedicated to either ascending or descending passengers. 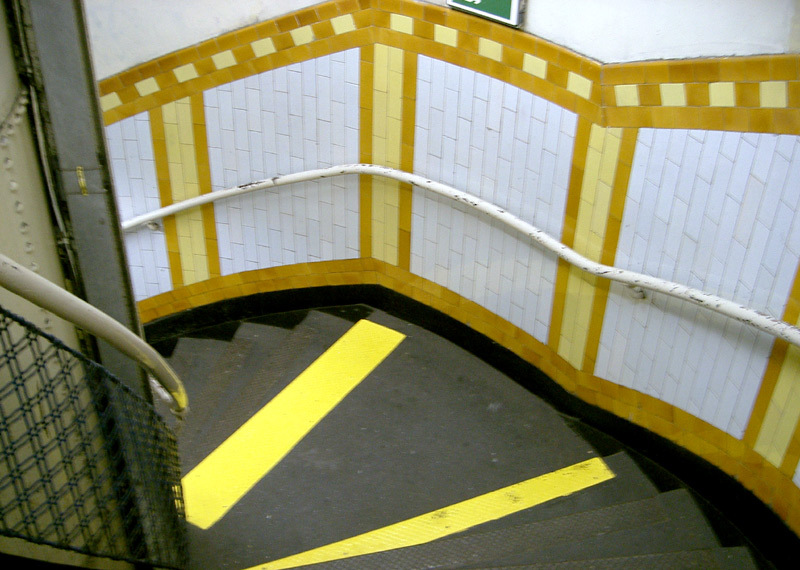 The pictogram signage on the step risers will only be visible to ascending passengers; to give this separation a chance to work extra signage will be required to advise descending passengers to use the correct side of the stairway. There will still be conflict however, but only between passengers who are walking at different speeds. 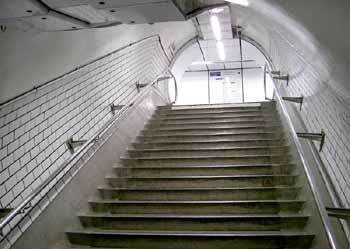 Another solution would be to make people going in opposite directions take turns in using the stairway. 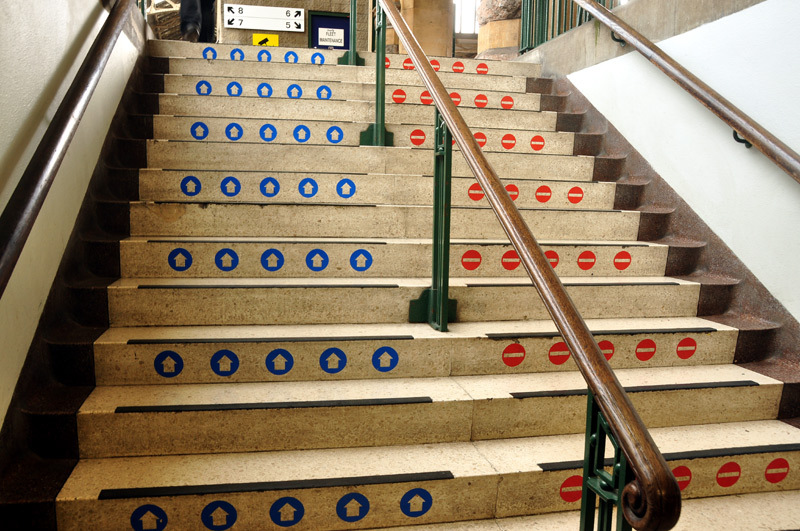 This would require several members of staff to enforce and would be very unpopular if it resulted in arriving passengers being denied access to the stairway in a way that results in them missing the train. Bi-directional stairs at Bristol Temple Meads station. Please Allow Passengers To Alight From The Train Before Trying To Board It! 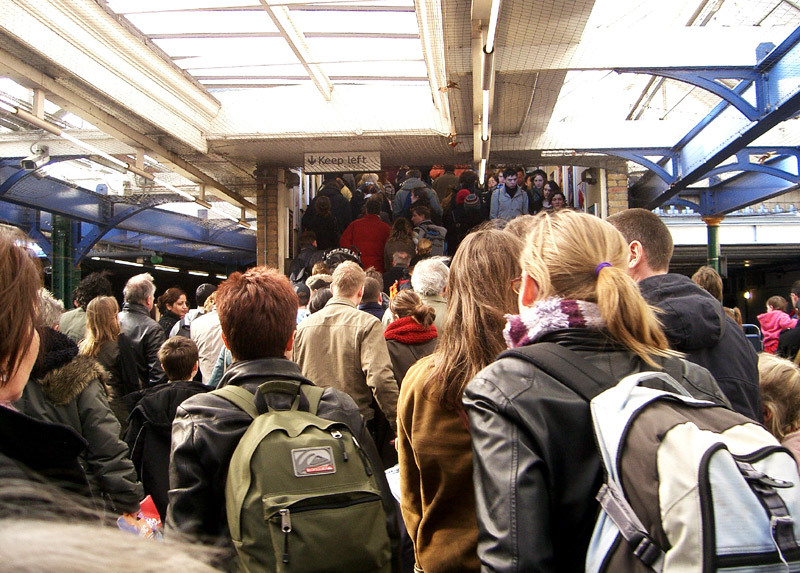 A frequent occurrence at busy times is that the "scrum" of passengers wanting to board a train prevents those wanting to alight from doing so. This can significantly increase the dwell time a train needs to spend at stations - which (unless there is an alternative track and platform it can use) makes the next train wait until the first train has left the station. Delays such as this slow the entire service as well as reduce the total number of trains which can travel along the track, which means that the trains which do run will be more crowded than they might have been. 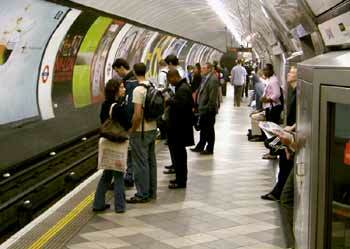 One partial solution is to mark "waiting areas" and "passenger flow indicators" on the platform surfaces. Then with alighting passengers benefiting from easier alighting the boarding passengers can enjoy freedom to do so uninterrupted. Of course it helps when the trains always stop accurately at exactly the same location - but as the stations seen here also feature platform doors so this will already be the situation. 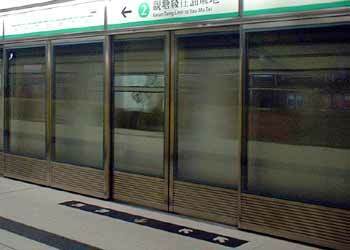 "Waiting areas" and "passenger flow indicators" marked on the platform surfaces. Images show a MRT station in Singapore (left) and a MTR station in Hong Kong (right). 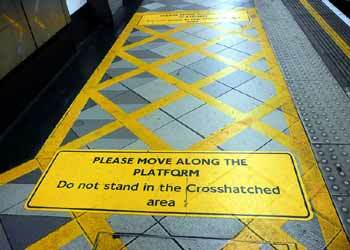 The above images have been edited to show closer views of the platform markings. Clicking them will open larger versions (of the edited pictures) whilst clicking the links will display the relevant pages at "Wikipedia" showing the photographs in their original format. Another possibility for very busy stations would be to locate platforms on both sides of the train, (or tram, bus etc., if they are equipped with passenger doors on both sides) perhaps with the platform on one side being designated for arriving passengers and the other platform for departing passengers. Slightly delaying opening the doors for passengers who wish to board the transport and the use of automated information systems within the train would help encourage those who are alighting to use the doors on the correct side. This is known as the Spanish solution (and sometimes as the Barcelona solution) after several stations on the Barcelona (Spain) metro system were built so that there were four platform faces between the two sets of tracks - ie: each track is served by an edge platform on the outside plus one side of a shared wide island platform which is located between the tracks. Elsewhere globally just a handful of stations are known to have been built in this way, with locations including São Paulo (Brazil), Paris (France), Boston, (USA) several cities in China, Japan, Germany and a few others. Most cities which use the Spanish Solution only do so at a couple of their stations. One location worthy of special mention is New York City (USA) where changing demographics and a resulting reduction in passenger numbers have seen several stations which previously used the Spanish Solution close one or more of the platforms. 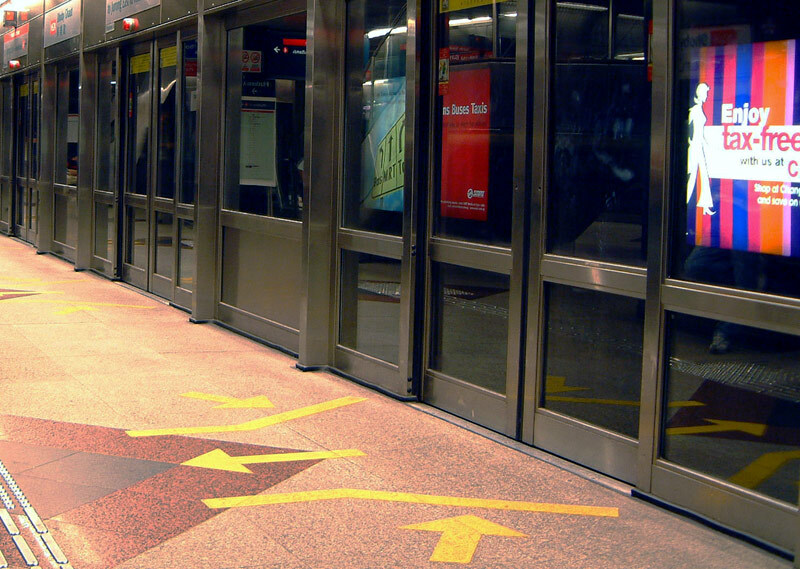 Separating the passenger flows in this way helps reduce conflicting movements between the passengers who are trying to alight and those who trying to board the train (tram, bus, - or lift!, etc), thereby helping to reduce overall stop dwell times. 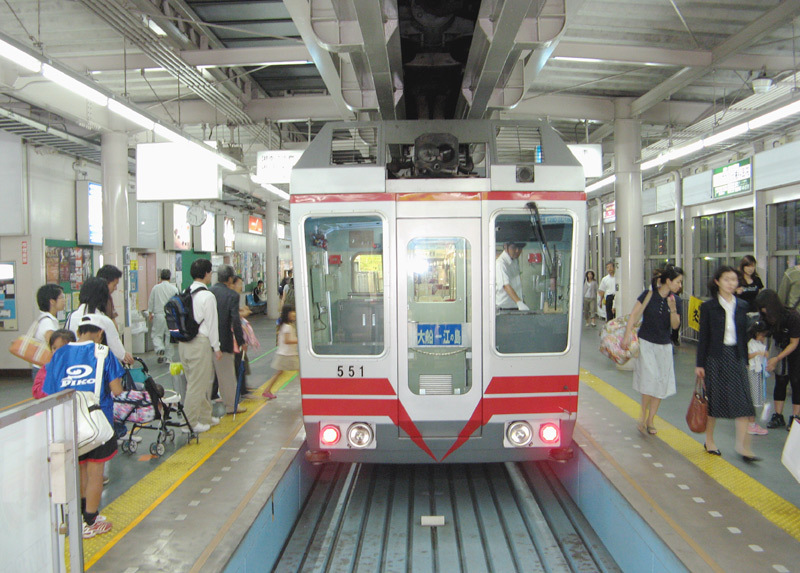 It should also help expedite passenger flows within stations by preventing the all-to-common situation whereby passengers use the wrong passageways to / from the platforms, in the process reducing the effective (available / intended) width of the passageway and the speed at which passengers pass through it. Although this form of passenger flow control is quite common with many station lifts it is not (in London) generally used on station platforms. Perhaps the principle reason for this would be that most of the busiest stations are already extant - and the cost of retrofitting them with extra platforms would be enormous - especially for those which are below ground. Even though all the tracks at Canary Wharf station on the Docklands Light Railway have platforms on both sides (ie: 6 platforms for 3 tracks, 2x side and 2x island - the station was built like this from the outset) there is no flow control, so passengers can simultaneously board and alight on both sides of the train. 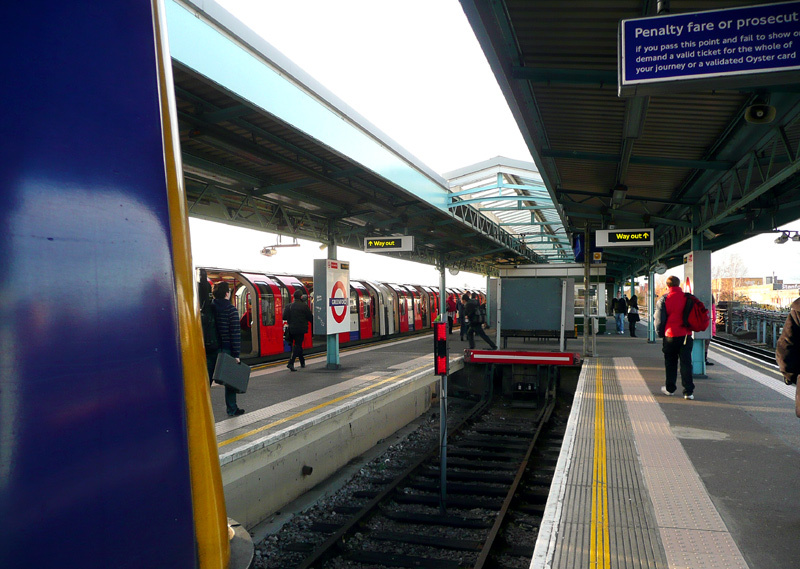 Elsewhere in London a handful of stations also feature tracks with platforms on both sides so as to provide cross-platform interchange with two different rail services. However, with modern 'sliding door' trains and railway staff who for 'whatever' reason do not unlock / open the doors on both sides of the train so sometimes passengers are unnecessarily inconvenienced when the doors are only opened on what for them is the 'wrong' side. One of the lifts at Hampstead station on the London Underground; note the message above the open doorway on the far side stating that passengers leaving the lift should do so through that entrance. 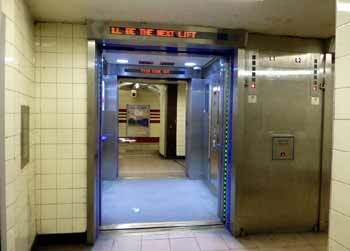 This helps avoid conflict with passengers wishing to enter the lift. Passengers alighting and boarding at doorways on both sides at Pragsattel station on the Stuttgart, Germany, 'Stadtbahn' (city railway) light rail system. Olympic Park station on the Sydney (Australia) Cityrail system which was specially built using the Spanish solution to cope with the large numbers of people attending the 2000 Olympic games. At normal times only the centre platform is used, whilst at 'special event' times arriving passengers disembark onto the central island platform and departing passengers use the edge platforms. 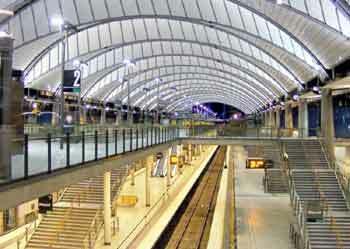 http://commons.wikimedia.org/wiki/File:Olympic_Park_railway_station.jpg. 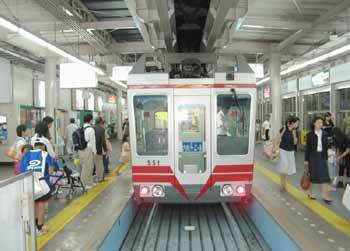 A station on the Japanese Shonan monorail showing passengers boarding and alighting on different sides of the train. The location where the photographer is standing gives rise to the assumption that he / she had walked behind the train once it had arrived at the station - this being a potentially dangerous thing to do. Avenida de América station on line 7 of the Madrid Metro. 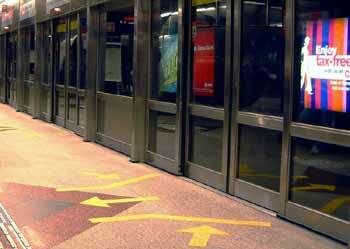 A clear example of Spanish solution (third central platform). There are several stations in London which feature three tracks where the centre track benefits from platforms on both sides. Most of these are on the Underground railway system and are at locations where trains terminate in the bi-directional centre track. A 'double' Spanish solution. Uniquely in London Canary Wharf station on the Docklands Light Railway was designed to handle large passenger volumes by featuring three tracks and six platforms! At this station the centre track can be accessed from either end, so whilst it is mostly used by terminating trains it can also be used by trains making through journeys. In this photograph (which was filmed through a glass window) the trains using the outer tracks are moving and a little blurred. A variant of the Spanish solution can be found at Tower Gateway Station on London's Docklands Light Railway, which when (in early 2009) it was re-opened after platform lengthening works featured just a single track flanked by two platforms, one of which is dedicated to arriving passengers and the other to departing passengers. Despite being a terminal ('end of line') station the fully automated nature of the trains means that they can be in and out as quickly as it takes passengers to alight and board. This is because the member of staff who closes the train doors and initiates station departure can do this from any doorway / does not need to walk from one end of the train to the other end for it to reverse direction. More examples of termini where passengers benefit from platforms on both sides. As an aside, these are both funicular railways which serve steeply graded routes for which neither steel wheeled or rubber tyred normal 'adhesion' railways would be suited. 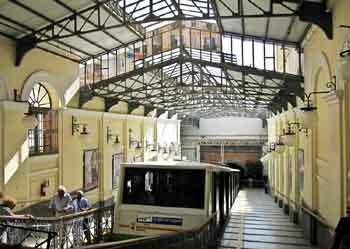 Funicular railways are looked at on the Cable Transports page. Right: Taksim station of the Füniküler Kabataş-Taksim / Istanbul, Turkey, metro. Another reason why stations might feature platforms on both sides would be because they are where some trains terminate (end their journey & reverse direction of travel) whilst other trains continue further along the route. These bi-directional centre (third) tracks will either end at a fixed buffer stop or be joined at both ends to the main tracks, so that if required trains could also use the centre track for through journeys. The advantages of this arrangement is that passengers wishing to continue their journey are able to alight on the correct platform (on one side of the train) and when it is ready to leave passengers travelling in the "opposite" direction are able to board the train (from the other side) - in both cases without having to use passageways, underpasses, footbridges, steps, etc which would often be the situation for passengers travelling in at least one direction had the train been using a side or bay platform. London's Greenford station has a central track which serves an infrequent branch line flanked by platforms used by the Underground railway. 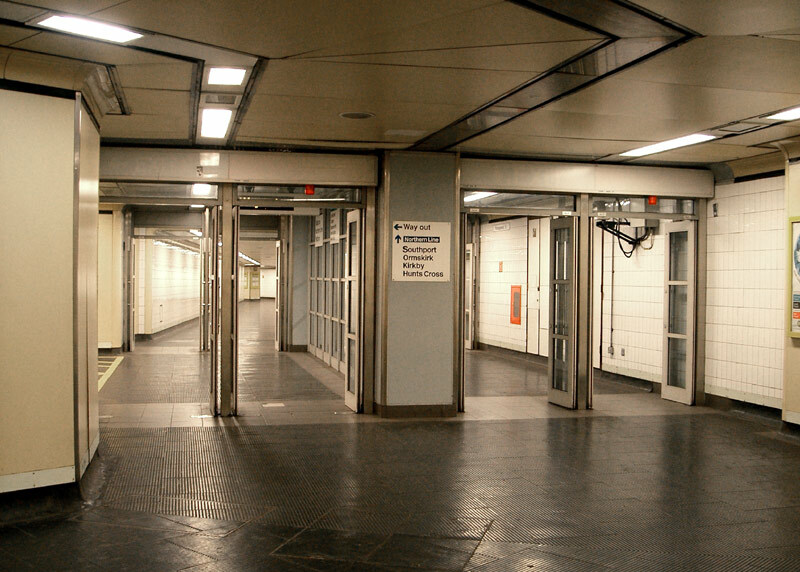 However, since the advent of trains with powered sliding doors the trains which terminate here only open the doors on one side, which is often inconvenient for passengers and somewhat negates the benefits of this station design. The red arrow in the image on the right points to a passenger who having been denied the originally intended easy cross-platform interchange was risking an accident (possibly with another passenger) by making a mad dash to catch the westbound Underground train while it still had its passenger doors open. Also seen is the front of the mainline railway diesel train which is using the central track. Cross platform interchange between trains (and / or trams) serving different routes is well known but normally there is just a single island platform between the trains. 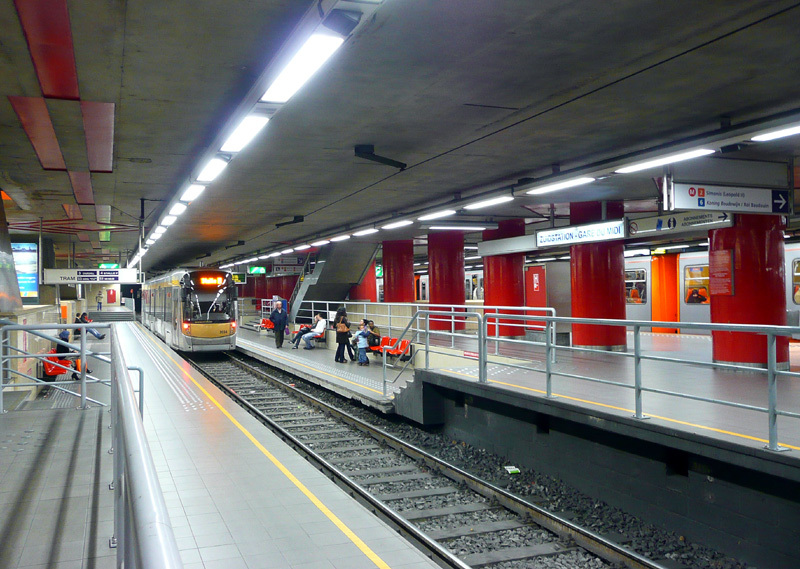 These images come from Zuidstation / Brussels Midi where both the metro and trams / light rail pre-metro benefit from individual outer (side) platforms and a shared central island platform which makes it easy for passengers to interchange between the transports. This helps prevent overcrowding and partially separates passenger flows at this very busy station. Both of these photographs were taken from the outer (side) platforms - in the photograph on the left the tram was ready to depart just as the metro train arrived whilst in the photograph on the right the view looking through the metro train's open doors reveals the tram in the distance. The platform height differences are because the trams are designed for kerb height platforms so need low platform sections. The station was built this way as the longer term aim is to replace the trams with metro trains, so the station was built in a way that would facilitate easy conversion to high platforms. Double cross platform interchange looking from one train through another train (which has its doors open on both sides) to see a third train! 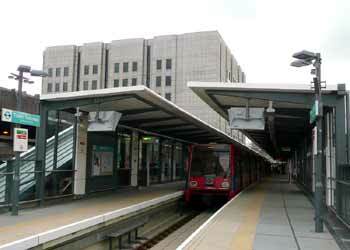 This image comes from Barking station in London where the eastbound underground trains open their doors on both sides so as to provide cross-platform interchange with two different mainline railway services. 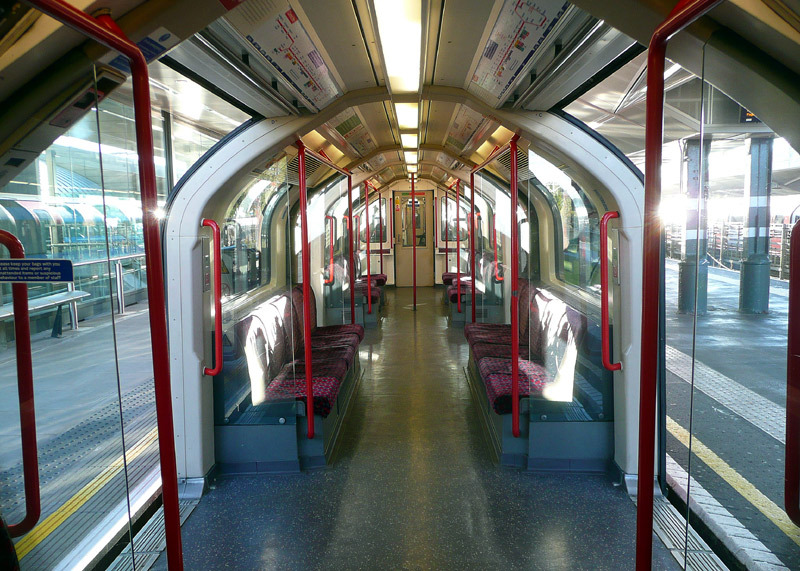 The only other location where London's Underground trains regularly open their doors on both sides is the westbound Central Line at Stratford. 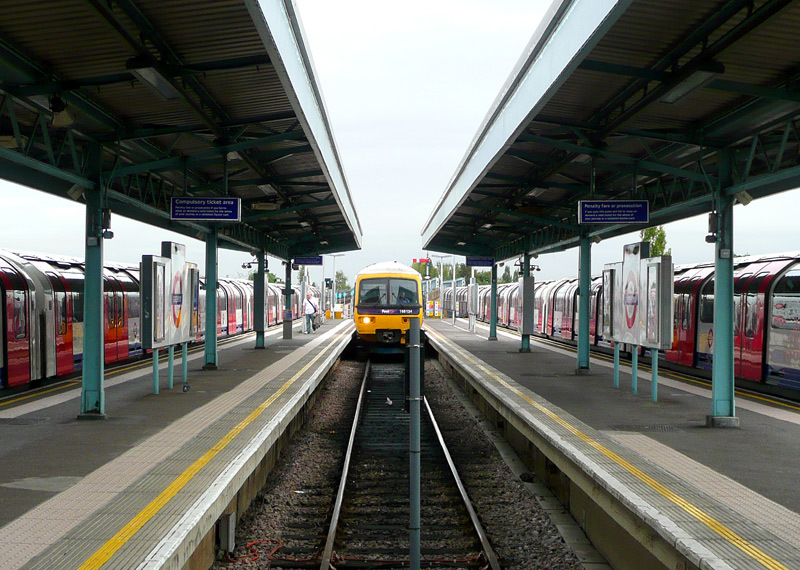 The required second platform was installed as part of upgrade works for the London 2012 Olympic Games, for which Stratford was the closest station to the Olympic Park.